Financial Huggery – Love. Life. Practice. It makes perfect sense that I would be writing about hugs on “Love” day. After all, it’s a well known fact that hugs increase oxytocin, reduce the stress hormone cortisol, and have many other wide and long-lasting healthy effects. There is concern that we may be in a hug-scarcity era for humanity. 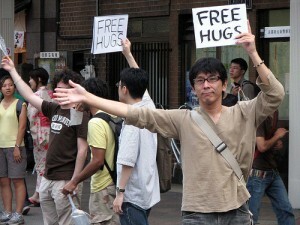 For that matter, the originator of the “Free Hugs” movement has parlayed it into a movement that is funding schools. Hugs are good. Obviously. And in case you ever meet me, yes, I am a hugger. I prefer the “1” hug to the “A” hug (look at the shapes of the letters to get an idea of what that means) but really, any hug is good. It can be the full-body contact of a very close friend, or the manly “handclasp-pull-chest-to-chest-slap-back-twice” that is so prevalent amongst the machismo. The best hugs come from my grandson Harvey, when he’s tired, and wants nothing more than to sleep, and I become a mattress for him. However, that’s all touchy-feely woo woo stuff. I’ve pledged that this blog will be about “Practical tools for making hard times happier.” So I’m going to prove to you a much more attractive reason to hug people. You see, I’ve been traveling for about a month now. Early on in the affectionately-named “Insanity Tour” I left my everyday glasses at a friend’s house in San Francisco. I discovered this when I’d already traveled on to Los Angeles – and only then after I’d already called the eyeglasses chain to see about getting them replaced. That was not a fun conversation. I had bought these glasses in a time of relative wealth, and so they were decked out. Polycarbonate lenses. Designer frames. The works. I could get a duplicate pair for $347, the clerk helpfully explained, but since it’s been about two years since my last eye exam, they couldn’t just use the prescription for a cheaper pair. I was resigning myself to a few weeks of headaches and blurry distance vision, when my friend in San Fran called and said he’d found them! $23 later I had them delivered to the LA hotel (the Good Hotel, incidentally, and I highly recommend it – Maille, especially, at the front desk was very helpful). Everything was good. After LA there was Columbus, Ohio for a week. Then Boston for a couple of days, and then a day visiting my friend the photographer Michele Serchuk and her husband Delano in upper Manhattan. They graciously let me stay with them that night, and the next morning, while packing…I couldn’t find my glasses. Nope. Nowhere. Went around the corner to the diner, but nope, I hadn’t left them there the night before when we had dinner. They weren’t in my Ultimate Backpack of Many Pockets. I went back up to their apartment, looked around one last time…no glasses to be found. Once again, I resigned myself: blurry vision. Headaches. $347 at some point when I could afford to save it up. I realized immediately what must have happened. Turning, I saw, sure enough: my glasses on top of the bookshelf in her living room. Well above my eye level, and I have no memory of putting them there. But because we hugged goodbye, with her facing that direction, with a bit of a height difference that made her look up…and there they were. $347 saved by a hug. The lesson is easy and obvious, so I won’t belabor it over the weekend. Whether it’s for a cause like Hug It Forward or just to make a friend’s day a bit better, hug. The money you save may be your own.